Where would we be without George Michael reminding us that being rich and successful doesn’t stop you from being a monumental idiot. Not content with almost ruining his career by being caught performing secret hand shakes in an American toilet, or being taken off the roads for being found to have more alcohol in his blood than a distillery has in barrels, or being caught night prowling on Hampstead Heath- he’s trying again. 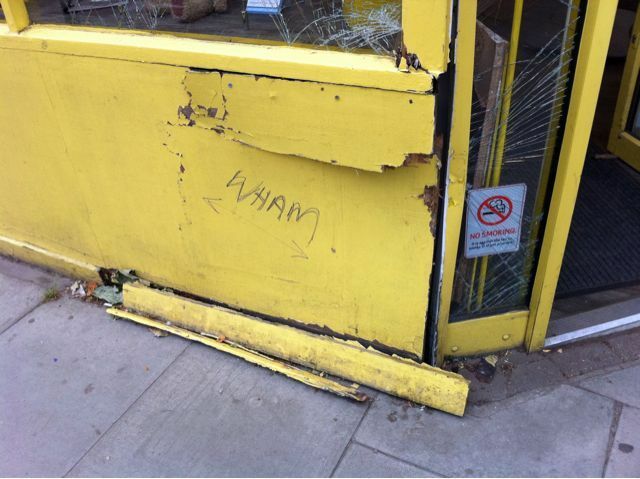 This next victim is an innocent happy snaps store which was ram-raided by sir George, presumably because it looked like an American off licence. Either that or he desperately needed a frame. Just to make it clear who was the perpetrator of this act- someone has added a very comic book-esc sound effect to the wall which, coincidentally, sounds like his band…oh wait… I see what they did there. Many thanks to Ed for the pics of this!